Steeped in ritual, tradition and meditative practice, this way of preparing matcha provides an intense taste, smooth, sweet and vegetal. Whisk briskly back and forth to create a foamy cup of delicious matcha. Dilute according to taste, adding more water as necessary. As above but use 2 teaspoons or 4 scoops of high grade matcha and 30ml or 1oz of water. While you may use an ordinary bowl, spoon and egg whisk to achieve this, the results will not mirror those in the picture above. For anyone wishing to go this route, we would recommend you purchase the relevant accessories to do so. Not only are they perfectly designed for the task at hand, their unadorned elegance will transmit some of the essence of the spirit of chanoyu (tea ceremony). It is said you need to whisk 100 pounds of matcha before you know how to make a real cup of tea. As with anything practice makes perfect and the difference between a well-whipped cup of matcha and a poorly whipped one is vast. Here are a few tips. Be sure to use a bamboo whisk – the more prongs the better. Accept no substitutes if you intend to prepare this style regularly. Sift the matcha before whisking, ideally with a matcha furui, specially designed for just this purpose. Be sure to use the correct water – if your water is too hard it may prevent you from creating a wonderful frothy matcha. Experiment with different types of mineral waters if you experience this problem. Start whisking at the bottom of the bowl breaking up the lumps in a slow figure of 8 taking care not to crush the delicate tines of the whisk. As you start to gradually, naturally, increase your whisking rate, gradually elevate the whisk in the water. By the end of the process, you should be whisking very briskly towards the surface of the tea; break up any large bubbles (the more prongs your chasen has, the easier this is) and finish in a figure of 8 drawing your chasen straight up from the center of the bowl to create a perfect smooth matcha that rises in the middle. 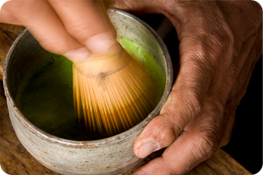 As matcha is prepared in an open bowl at 80c it is important to not spend too long on this process. As a guide we recommend you initially spend no longer than 45 seconds from start to finish. As you become more proficient, you can reduce it to less than half that. Masters can do it in a few seconds. If your first attempt looks and tastes poor, don’t despair, most beginner’s attempts at ceremonial tea is unimpressive. With practice you will soon discover just why this is the only tea to inspire a tradition which has had such a wide influence on Japanese philosophy and aesthetics.